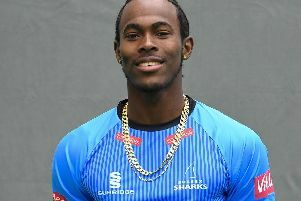 Sussex, attempting to boost their promotion ambitions with a third straight win against bottom side Glamorgan, needed a spirited last-wicket partnership between Jofra Archer and Danny Briggs to gain the upper hand on the opening day of their day-night Specsavers County Championship Division Two fixture at Hove. Sussex had the better of the opening session but the Glamorgan bowlers proved tenacious and took five wickets in a 20-over spell, assisted by a pink ball that swung after lunch. Sussex, however, have a long tail and the partnership of 61 between Archer (19) and Briggs (46) saw them to a third batting point for passing 300 before they were all out for 327. Openers Luke Wells and Phil Salt built a decent foundation to the innings with an opening stand of 73. Salt was in particularly impressive form, striking eight fours in his 52-ball 48 before he was dismissed by a fine delivery from Michael Hogan, which straightened and lifted to have him caught behind in the 19th over. Sussex were still well set at 114 for one at lunch. But they lost Tom Haines to the first delivery after the interval and the Glamorgan bowlers remained on top for the rest of the session. Haines, playing his first championship game since scoring a century on debut against Durham at Arundel last month, came into the side for the rested Luke Wright. But, attempting to work the ball to leg, he edged Lukas Carey to Nick Selman at second slip. Wells, who had been more sedate than his opening partner, leg-glanced Michael Hogan to reach his fifty from 100 deliveries. But Sussex lost a third wicket at 139 when the in-form Harry Finch, driving without any foot movement, was caught behind off Hogan. Finch’s solitary run occupied 32 balls. And one run later Wells hooked Hogan to long-leg for 71 from 142 balls. Wells said later: "It felt good to be back in the runs. I didn’t feel at my flowing best but I’d rather make some ugly runs than a pretty 20 any day. I was disappointed I didn’t turn it into three figures but it was nice to get a few. Michael Burgess was dropped first ball at third slip but Glamorgan were not made to pay for their aberration. The batsman was caught behind having a swing at a wide delivery from Jeremy Lawlor for 13. And it became 171 for six when David Wiese swung wildly to give the busy keeper Chris Cooke another catch. Ben Brown and Chris Jordan revived the faltering innings with a seventh wicket stand of 83 in 24 overs. Both batsmen failed to reach deserved half-centuries. Brown (49) was caught behind attempting to cut a ball that was too pitched up for the stroke, and in the next over Jordan (46) was bowled by Hogan. Sussex were 254 for eight and Glamorgan were on top once more, even more so when Ollie Robinson was caught at second slip at 266 in the first over with the new ball. But in Briggs Sussex have a first-class century maker batting at No 11 and he and Archer hit merrily under the floodlights until Briggs fell in the last over of the day.